GAZA CITY, Gaza (CNN) -- Israeli forces fired on a U.N. aid convoy Thursday in Gaza, killing at least one contract worker and prompting the U.N. to halt some of its operations in Gaza, U.N. officials said. 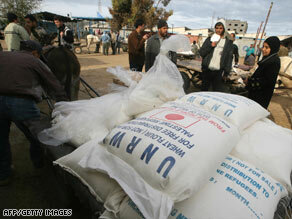 Palestinians distribute U.N. food aid Thursday in a refugee camp in southern Gaza. The U.N. has "lost confidence" in the Israeli military's attempts to allow humanitarian aid into the Palestinian territory, the U.N. Relief and Works Agency's director said. Meanwhile, the U.N. Security Council late Thursday overwhelmingly approved a resolution calling for an immediate cease-fire in Gaza. Fourteen of the council's 15 members voted in favor of the resolution -- with U.S. Secretary of State Condoleezza Rice abstaining from the vote. Hours before the resolution was approved, U.N. Secretary-General Ban Ki-moon demanded an investigation into the convoy incident he said killed two contract workers near the Israel-Gaza border. UNRWA director John Ging said one aid worker was killed. "We are perfectly willing to take risks, but something has to change," Ging told reporters from Gaza City. "If they give us the clearance to move, it is [unacceptable] that their soldiers are firing on us from the ground." Ging said an Israeli liaison did not dispute that Israeli forces fired on the vehicle. Four U.N. staffers have been killed since Israeli airstrikes on Gaza began December 27, and two U.N. schools in the territory used as civilian shelters have also been hit by the Israeli military. The aid agency provides food and relief supplies to some 80 percent of Gaza's 1.5 million people, but it says it has been unable to reach many Palestinians or assess the situation in Gaza during the Israeli military offensive. The absence of foreign journalists -- whom Israel has barred from entering Gaza -- is preventing the truth about conditions there from getting out, Ging said. "We have horrific stories coming out now. ... You have to brace yourself for more," Ging said. "This is a horrific situation." Red Cross workers on Wednesday found numerous wounded Palestinians in the neighborhood of Zaytun, the organization said in a statement. The injured included four children, too weak to stand, next to their dead mothers in a house containing 12 corpses, the International Committee of the Red Cross said. Palestinian medical sources said Thursday that 765 Palestinians have died in Gaza -- nearly 40 percent of them women and children -- since the Israeli military operation began. Three Israeli soldiers died in the fighting on Thursday, bringing to 10 the number of Israeli soldiers killed in the operation. Three Israeli civilians and one of those soldiers have been killed in rocket strikes from Gaza. The Israeli military says its operation is aimed at halting the firing of rockets into southern Israel by Hamas, which has controlled Gaza since 2007. But militants have continued to fire dozens of rockets and mortar shells on southern Israel since Israel launched its military operation. More than 20 rockets were fired into Israel on Thursday, Israeli police said. The mounting death toll and humanitarian concerns in Gaza are being addressed by cease-fire proposals now being considered by Israeli and Palestinian diplomats in Egypt. Israel continued its military operations in Gaza even during a three-hour period in which it said it would halt its offensive activities to allow for "humanitarian activities." At least 50 trucks carrying aid were allowed into Gaza on Thursday, but it is unclear if any of the supplies were distributed to civilians. Much of the U.N.'s aid is stuck at the Kerem Shalom border crossing because the private company that drives the aid in is refusing to enter Gaza "because the situation is too dangerous," U.N. Humanitarian Affairs chief John Holmes said. Israel has periodically opened some of its borders with Gaza to allow aid into the territory during the military campaign. During the three-hour "truce" on Thursday, large explosions could be heard from central Gaza and small arms fire from northern Gaza, according to CNN's Ben Wedeman, reporting from along the Israel-Gaza border. Also, Israeli armored bulldozers demolished a home in Gaza "just as the lull was supposed to go into effect," he said. Video shot from the border showed the home -- with two white flags flying on the roof -- crumble to the ground as the bulldozers plowed into its side and roll over the debris. "We saw a man coming out of that house with a white flag and until now we have seen no sign of any military activity in that area," Wedeman reported. "There have been no shots fired from that house." The Israeli military had no comment on the incident. A three-hour truce on Wednesday was also marred by fighting which Israeli officials said were in retaliation for Hamas attacks on Israeli forces. There was no immediate claim of responsibility. Hezbollah assured the Lebanese government that it was not responsible for the attacks, the Lebanese information minister said. Hezbollah has kept a tight rein on its forces in southern Lebanon since the cease-fire following its war with Israel in 2006. A number of Palestinian factions operate in southern Lebanon as well. CNN's Talal Abu Rahma, Michal Zippori, Ben Brumfield, Terrence Burke and Richard Roth contributed to this report.